Francine's Friends: October 13, 2017 — 13th Annual "Lunch With Friends"! October 13, 2017 — 13th Annual "Lunch With Friends"! 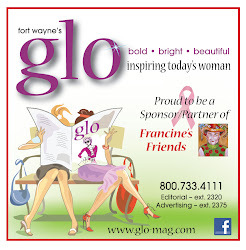 Nearly 600 women (and men) attended the 13th annual "Lunch with Friends" at the Allen County Memorial Coliseum to help raise funds to support the mission of Francine's Friends — to ensure ALL women in northeast Indiana are able to have screening mammography on the Francine's Friends Mobile Mammography coach, regardless of any barriers. This year, we were thrilled to welcome many returning alumni models/survivors from our 2005-2016 luncheons. 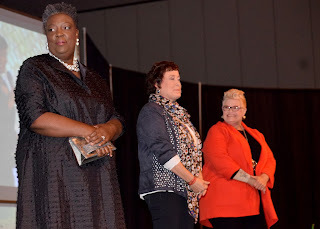 Linda Jackson, Evening Anchor of Fort Wayne's NBC and long-time FRIEND, was back on stage as the vivacious emcee of the luncheon, who had the crowd taking selfies and trending #FrancinesFriends on social media. After an invocation by The Rev. Dr. Kathleen Haller, Trinity English Lutheran Church, Board President Sharon Simmons had everyone up on their feet in honor of breast cancer survivors. Simmons continued with remarks about advances made in early detection and treatment resulting in less invasive surgeries and therapies. Simmons also expressed gratitude to the various organizations and groups holding third party fundraisers to benefit Francine's Friends. "We are blessed by all of these efforts," remarked Simmons. "It is so much fun for board members to attend these events and talk about the importance of early detection — from the 'Ride for a Cause' sponsored by the Moonshine Cowboys — to the Todd Alber Annual Golf Outing — to the Tri Kappa DeKalb Pink Out — to all the Pink Outs sponsored by area sports teams — to events to raise awareness like Glo's Wine, Women and Wellness and area health fairs," she concluded. To date, 2017 third party events have raised more than $34,000 for Francine's Friends, with additional events still happening in October, including a SkyZone promotion and the Summit Plastic Surgery Open House and fundraiser. Then it was time to meet Tamyra, Patty and Vicki, this year's survivors, with the help of our feature video produced by Punch Films. All were diagnosed on the Francine’s Friends coach — Tamyra at East Allen County Schools, Patty at OmniSource, and Vicki at Life Center of Fort Wayne, a community site. The big fashion reveal was up next, showcasing the makeovers of our three special ladies courtesy of Julie Eckert Clancy, owner of Jophiel, Lacie's Hair Design and The Red Stiletto make-up artists. These beautiful ladies ROCKED the runway and brought the house down with their stage presence! The other heart and soul of our annual luncheon — our generous Table Captains — were also acknowledged and thanked for their efforts in bringing together all of THEIR Friends to fill the seats, along with other community partners and supporters. Each year, some very special Friends annually create a Sustaining Friendship Circle — “Bosom Buddies for Life” — through a $1,000 donation. All 2017 Bosom Buddies received a limited edition print of this year’s original artwork “Sowing Seeds of Love” created by our FRIEND and artist Terry Ratliff. More than a quarter of a million dollars has been raised to support screening mammography and our mission through this giving circle! 2017 Bosom Buddies include: Ann Bobilya, Cheryl Brockmann, Sharon Eisbart, Ronda Hanning, Glynda Harris, Debbie Hirschfield, Nancy McNabb, Kim Murphy, Dar Richardson, Ari Rifkin, Judy Rifkin, Chris Rupp, Sharon Simmons, Debbie Swinford, Carolyn Tyndall, Irene Walters, and Mary Ann Ziembo. 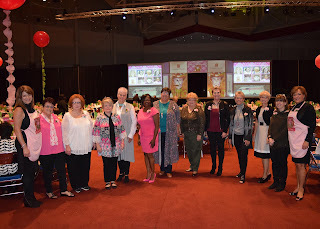 This year's event luncheon sponsors were Kroger, Radiation Oncology Associations, Physicians Health Plan, Vera Bradley, Steel Dynamics, Briner, Fort Wayne Medical Oncology and Hematology, OmniSource, Do It Best, Emley Design Group, Glo Magazine, Punch Films, and Shaffer Multimedia. 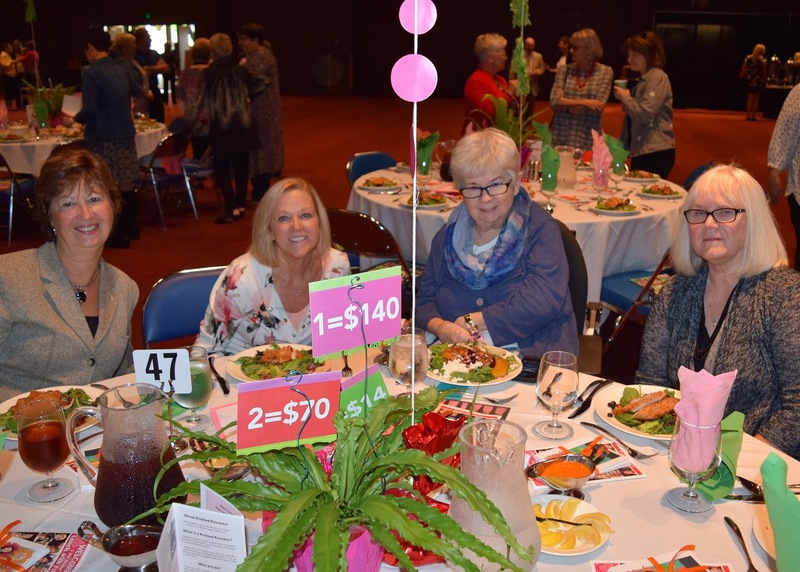 2017 Corporate Tables included BAE Systems, Breast Diagnostic Center, Brigadoon Fitness, Lake City Bank, Medical Protective, Parkview Comprehensive Cancer Center, Old National Bank, PNC Bank, and Women’s Health Advantage. The luncheon closed with Linda Jackson reminding everyone of why we were together: "Through YOUR continued generosity, the mobile mammography coach will go out into Fort Wayne and our surrounding communities — to businesses, clinics, health fairs, community sites and rural sites in 11 counties in northeast Indiana — for screenings YOU make possible, and even MORE women will learn that 15 minutes can save a life," Jackson explained. "Through YOUR continued generosity, more women will be able to take care of this potentially life-saving screening at their place of work, on their lunch hour, before they pick up their kids from school, or in between errands, and after taking care of and saving everyone else, can do something to potentially save themselves." Since its inception, Francine’s Friends has funded 14,053 mammograms, and afforded 10,979 women their first screening mammogram. The all-volunteer organization has raised $1.6 million from its annual October fundraisers (from 2005-2016) to fund screening mammograms, and screened 40,085 women to date (June 2017) who are insured, under-insured, or have no insurance. Donations may still be made to Francine's Friends to help provide early detection screenings. The average cost of a mammogram is $140. Click here to make a donation online! Click here to view the feature video from this year's "Lunch With Friends"
Click here to view the Facebook photo album from this year's "Lunch With Friends"
Get YOUR Indiana IBCAT License Plate!